‘How this coast smells of riches!’ So wrote the American Jane de Glehn, wife of the English artist Wilfred de Glehn, when she first set foot on the Riviera after the end of World War I. A member of the Red Cross Committee, who had worked in the devastated areas of the Haute Marne and was now in the south to report on the medical conditions in the hospitals there, she felt the train from the north had deposited her in paradise: ‘To eyes fresh from the ruined homes of Eastern France, from the ghastly desolations and sublime endurances of the Front, this previous world of moneyed idleness, these innumerable villas perched on the hills and clouded with flowers, these glowing white walls and basking blue bays’ filled her with bemused delight. Those post war years became a time of frenetic gaiety for the young, particularly young women. The war liberated them to an extent undreamt of before 1914. The new young set began to realise there was much pleasure to be had either exercising vigorously in the sunshine or lying languorously on a beach. How better, if one was able, to forget the tragedy of the recent past. There were nightclubs ‘the fever of the age’ there were cocktails – and, for Americans, the pleasure of no prohibition. For the privileged there was liberty, romance and glamour and, for those who sought it, a tolerant society. The decades between the two world wars were also a time of wonderful inventions and great progress in ship and air travel. Car design became increasingly more elegant, for this was the era of the coach builder. 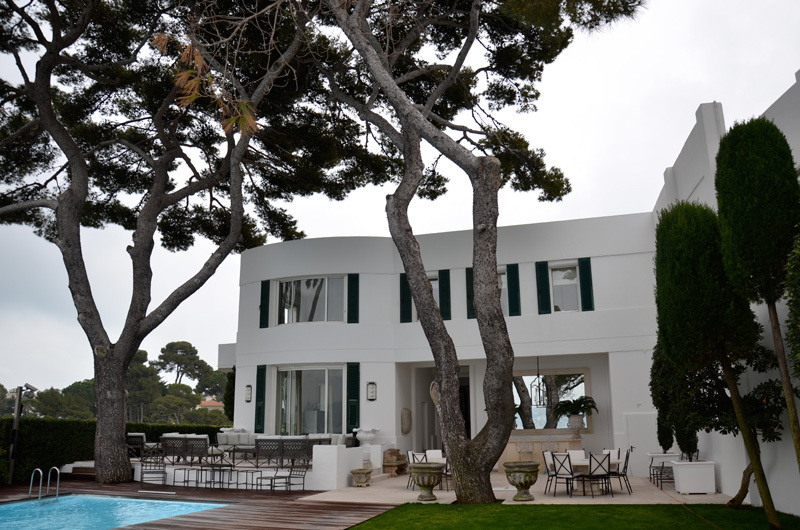 Periodicals such as La Saison de Cannes and Le Journal des Etrangers detailed the arrival of rich visitors to the coast. These visits were an opportunity for sophisticated entertainment and the chance to meet old friends and make new ones. Enjoyment was enhanced by starlit nights beside the rippling Mediterranean and the frisson of a Latin environment. It was not for nothing the couturier Jeanne Lanvin named her perfumes, created in nearby Grasse, My Sin, Scandale, Rumeur and Prétexte. It was into the excitement of the early 1920s that Barry Dierks, a young architect from Philadelphia, found his way to Paris to study at the Ecole des Beaux Art. From the delights of Paris and the Ritz bars, he discovered the South of France and would become the ‘American architect of the Riviera’, building or remodelling around eighty elegant houses on the coast, with his partner, the Englishman Colonel Eric Sawyer. These homes were almost always commissioned by English-speaking expatriates. They built their own splendid home high on the rocks of the Esterel, overlooking the Mediterranean sea. This widely admired house would become the template for Barry’s talent. They called their villa Le Trident and it would be their home for the rest of their lives. They were quickly described as ‘those two charmers’. Riviera Dreaming tells the stories of some of the international glitterati who lived and loved in these houses. But the hedonistic era of the 1920s would eventually drift into the more sober 1930s, until the Second World War changed everything. I caught a glimpse of those decades when we arrived in the Alpes Maritimes in 1977. There were still those who had lived and suffered throughout the last war and others, elderly now, who had enjoyed a privileged life in their elegant villas during the 1930s before returning to the Riviera after the liberation. I began to work as a volunteer in aid of the small Anglo-American Hospital in Cannes and as the older, richer expatriates died or returned to their own countries we received fascinating donations from their old, often luxurious, homes. I suddenly felt engulfed by the history of a period which would never happen again. Impossible not to pursue it in depth. Much ink has been spilt on the famous names of that time – the Fitzgeralds, the Murphys, Somerset Maugham, Michael Arlen etc. But there were many others who, although among the beau monde, are not known. Using some of the wonderful villas built or remodelled by Barry Dierks, I began to seek out their stories. I also had to find out about Barry himself and his partner Eric Sawyer. I quickly realised there was a great deal to discover. The events of 1939 drew the expatriate community from their sun loungers and flung them into a flurry of aid committees. Organisations were founded to provide help for families left bereft by the mobilisation, or to provide comforts for the troops, such as Le Vin Chaud du Soldat, La Soupe Populaire and Les Optimistes de la Riviera. An ambitious Anglo-American Home for French Children of the War was opened, then sadly soon closed for lack of funds. A Cantine Militaire was organised for soldiers arriving at Cannes station on troop trains. At first this was slow going, with a row of increasingly bored women sitting on the platform munching biscuits and bickering among themselves. A grandson of John Taylor, the esteemed estate agent of Cannes, wrote he had heard that one angry woman had hurled a plate of sandwiches at the head of another. Barry and Eric became deeply involved with various aid programmes. Barry joined the American Red Cross, seeking out and delivering foodstuffs to families whose men folk had been called up from one day to the next. Eric became a founder of the Anglo-American Ambulance Corps of Cannes, which was full of good intentions but unable to stand up to the advancing German army as they stormed through France. In 1940 almost all their expatriate friends and clients fled, but Barry and Eric stayed on and it was now that their own individual dramas began. The history of Antibes is, like the rest of the southern coast, one of shifting settlements, invasion and violence. In the fifteenth century Provence became part of the Kingdom of France, with Antibes as a border town. In the seventeenth century Louis XIV commissioned the great military architect Vauban to redesign the fortifications of the town, a major project of which the fort and some of the walls remain. Unlike Golf Juan and Cannes, in 1815 Antibes refused to join forces with Napoleon on his return from Elba, thus earning the gratitude of Louis XVIII. The house Barry remodelled for Beatrice Cartwright was, appropriately, on the Baie des Milliadaires within a stone’s throw of the Hotel Eden Roc and not far from the Château de la Croë rented by the Duke of Windsor and Beatrice’s old friend Wallis Windsor, formerly Wallis Simpson. 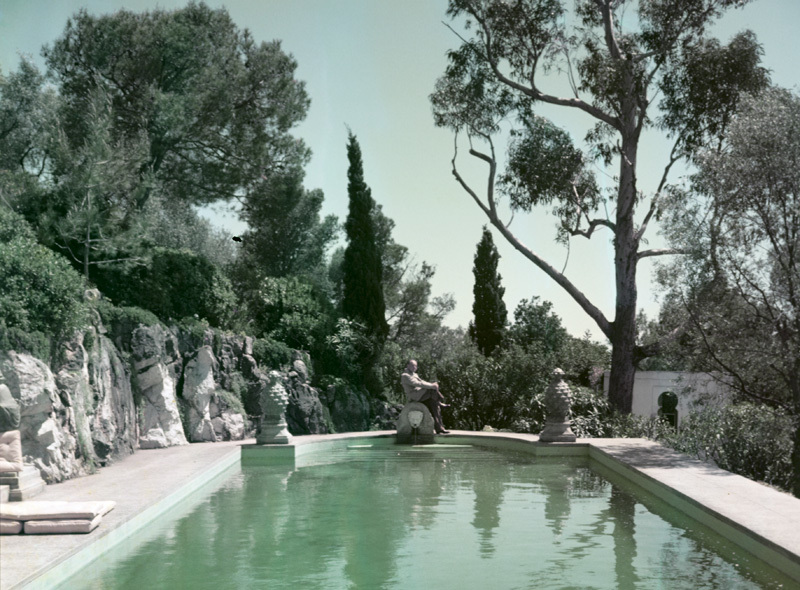 The Casa Estella had been built in the late 1920s by the American author Lloyd Osbourne, the stepson and collaborator of Robert Louis Stevenson. He sold it to Beatrice in 1932 and Barry and his team must have worked very rapidly to complete the major remodelling, for Beatrice was already writing from there at the end of the year.